Solid and engineered hardwood flooring are popular flooring options among our customers, and remain a huge trend in modern flooring. To ensure the durability and splendor of your hardwood flooring, many of today’s manufacturers use built in scuff resistant technology to keep floors looking their very best. Shaw’s ScufResist™ built in hardwood floor finish, for example, protects floors from marks, scuffs and scratches that could result from daily wear and tear. At Bassett Carpets, we understand the importance of following a protective care and maintenance routine for your new hardwood floors. Everyday care and maintenance could include sweeping, vacuuming or dry mopping your hardwood flooring. 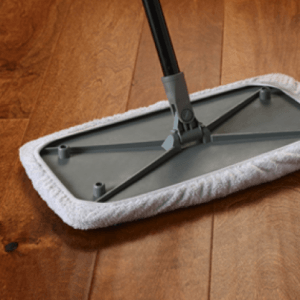 Make sure to check with your manufacturer’s care and maintenance guide, in addition to their list of approved vacuum cleaners, before caring for your hardwood floor. If your new hardwood floors need more than just a dry surface clean, use a manufacturer approved cleaning solution and follow their guidelines carefully. We sell the Shaw R2X Hardsurface Floor Cleaner at our store location, and you can also order refills online here (https://shawfloors.com/flooring/how-to/hardwood/care-maintenance/r2x-hardsurfaces-cleaner. Always hire a professional floor cleaning company for that intermittent deep,spring clean! For local recommendations, speak with any of our store representatives! Preventative maintenance for your new hardwood flooring begins with awareness of your surroundings. Frequently trim your pet’s nails or remove your high heels and heavy boots before walking across your hardwood floor. Since hardwood flooring is also sensitive to the indoor climate of your home, use a humidifier during the dry season and run a dehumidifier during inclement weather. Occasional spills and stains are just inevitable, especially if you have a house full of young kids or pets. Educating yourself on how to remove common household stains while preventing damage to your flooring is crucial. Most common spills like liquids or pet accidents will wipe away clean, especially on hardwood floors with stain and scuff resistant technology built into the hardwood finished. Make sure you mop up liquid spills immediately, as hardwood flooring is not water resistant. For other common stains like wax residue or nail polish, consult with the manufacturer’s guidelines.